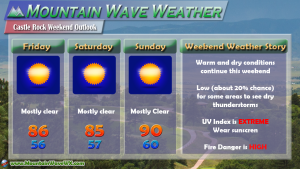 While it will be slightly cooler over the first part of the weekend, the overall trend for the foreseeable future is to remain very warm and very dry. 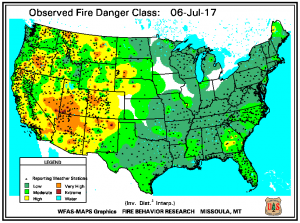 This will certainly not help our fire situation out as many areas are seeing major fires burning at this point in time. Friday: Expect cooler temperatures across the area with mostly clear sky’s. Temperatures should be in the mid to upper 80’s across most of the Palmer Divide with breezy conditions possible in the afternoon hours. Saturday: Cooldown continues as temperatures will remain in the mid to upper 80’s. Similar to Friday expect mostly clear sky’s and breezy conditions in the afternoon hours. Sunday: We will begin warming up again on Monday, which will be the first in a series of very warm and dry days. Expect temperatures during the day in the low to mid 90’s across the area with mostly clear sky’s. There may be enough moisture and instability to kick of thunderstorms each of these days. Due to the dry air at the surface we expect mainly wind and lightning form these storms with only slight chances of any rain. If you see any rain in your area this weekend, go buy a lottery ticket! The sky will be hazy through the weekend, Westerly and Southwesterly winds aloft will transport smoke from fires in Western Colorado and Utah into the area. There are several wildfires burning across Northwestern Colorado. 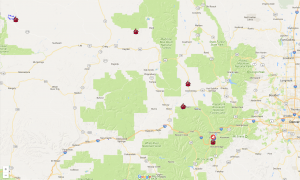 The most notable is the one near Breckenridge deemed the “Peak 2” fire. In addition to that, there are fires burning near Craig in Northwestern Colorado and Southwest of Kremmling. The fire danger across most of the front range remains high and will stay that way for the foreseeable fugure as we don’t expect much precipitation in the next 5-7 days. Many areas in the mountains are now at a “very high” rating for fire danger due to a combination of below average precipitation and above average temperatures. This time of the year it is typical to be dry between our wet spring period and the onset of the monsoon so this type of weather isn’t completely unusual. As we move later into July we will be keeping a close eye on whether the monsoon establishes to bring us beneficial rain or if it has trouble pumping moisture into Colorado. If you recall in 2016, the monsoon never set up well enough to benefit Colorado, so that’s something to keep a close eye on!